For a very long time, Bill Gates was the richest man in the world. In fact, he's been on the list of the wealthiest people in the world since 1987, when he first became a billionaire. From 1995 to 2017 he was the richest person in the world for all but four of those 22 years. Gates first became a billionaire in 1987. He was 31 and he was the youngest self-made billionaire ever at the time – and for a long time afterwards. It wasn't until Google went public in 2004 and made 30-year-old Larry Page a billionaire that Bill lost that title. Of course, the age of the youngest self-made billionaire kept getting younger and younger over the years with the second wave of the dotcom (and app) boom. Now Mark Zuckerberg ranks as the youngest self-made billionaire. He was 23 when he made his first billion in 2008. Gates didn't become a billionaire on the day in 1986 when Microsoft went public. The opening stock price was $21. After the trading day, the stock closed at $27.75 and Bill's 45% was worth $350 million. He would not become a billionaire until 1987 when the value of his stock in Microsoft surged. Gates and his friend Paul Allen created BASIC software for the early personal computer Altair in 1975. Over the next decade, the duo rapidly turned Microsoft into one of the preeminent tech companies in the world. In the early 1980s Gates developed the MS-DOS operating system and sold it to IBM on a non-exclusive contract that allowed them to sell the operating system to other companies. In the mid-1980s the first Windows OS was rolled out. When Microsoft went public in 1986, they had not just the first Windows system but also early versions of Microsoft Word and Excel. Gates became a self-made millionaire at the IPO. Less than a year later he was a billionaire. He was 31 years old. Over the years, Microsoft became an integral part of most people's everyday lives, boosting the value of the stock, and Bill's net worth. In 1999, at its peak, Bill Gates' Microsoft shares were worth $100 billion. Not long after that, Gates stepped down as CEO and began donating his shares to philanthropy by the billions. In 2010, he founded the Giving Pledge alongside Warren Buffett and vowed to give away most of his wealth in his lifetime. Bill Gates has sold about $40 billion in Microsoft stock and collected over $12 billion in dividends since the company's IPO in 1986. He used that money to create the holding company Cascade Investment, which has continued to grow and includes investments in companies such as Canadian National Railway and AutoNation. 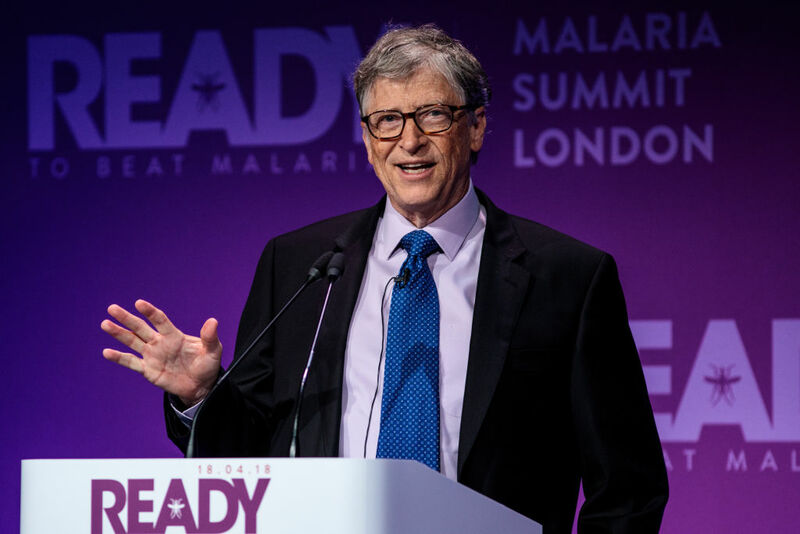 Gates is quite a philanthropist and donated a $3.3 billion payout he received in 2004 to his Bill & Melinda Gates Foundation. He still has a 1.3 percent stake in Microsoft. Today, Bill Gates is the second richest person in the world with a net worth of $100 billion. He trails Jeff Bezos, the world's richest person, by just $14 billion.